A still excited Tony Talbot proudly presented us with the attached photo on Tuesday night at the Kitefishing Clubs' monthly meeting. 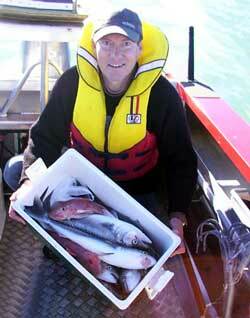 Tony fished from Muriwai Beach about 4 weeks ago in marginal conditions. On his first set Tony ran 25 hooks baited with squid and caught all the kahawai and gurnard in the photo. While Tony was well pleased with his first set he really wanted to catch at least one snapper for the day so decided to reset his longline, but with only 10 hooks attached to it this time. The second set was perfect the gear went out much faster and headed dead square offshore. The 10 hooks, again baited with squid, were left to fish for only 10 minutes before pulling the line in again. Tony really hit the jackpot, nine snapper from the 10 hooks set! The biggest weighed in at just over 7kg, most were around 4kg and the smallest was a very reasonable 2kg. Tony also reported that every single one of the snapper were found to be full of snapper biscuits when he cleaned them. Harold and I had a sneaky trip over the Manukau bar Saturday morning. We left Weymouth at daybreakand headed for the ocean anchoring in 6m about a mile off Hamiltons Gap. As the Northerly was rising we decided to only set one boat longline (baited with Kahawai). We caught a few gurnard and a Kahawai on the rods along with about four spiny dog sharks (bugger) while the longline was fishing. The photo on the right is a stunner. These are the kind of pics NZ Fishing News is looking for. Well framed subject, great background, clean fish and smiles. This is an excellent example for all of us. I got broken off twice by something really big. After an hour we pulled the longline in. It came up with another four good gurnard, four more large kahawai, another 10 spiny dogs, a grey shark and we even caught a carpet shark (double bugger). It was a great result with plenty for the smoker and pan, however I suspect the snapper may be in deeper waters by now. Attached photos are of the fish bin and Harald with a Kahawhai. We are sure you will agree that it is regular reports and photos of this quality that make this newsletter so popular. Don't forget to take your camera next time you go to the beach and please send your report in. Really wanted to put a report in here as I had rung Paul re twisted traces, and squid bait use. I fished Awatoto Beach in Napier on Sunday 21 July using a Kite Longline Rig. I tried salted mullet and got one gurnard and two kahawai. The first set of two sets went straight out. I weighted the line a bit more and did not get so many problem with twisted traces. Thanks for advice! I've put my Kite Longline out at Awatoto a number of times now and have had no issues with snags. The Napier City sewerage milliscreen outfall is at Awatoto so gut the fish well. The first time I put the kite out there I remembered about it after it was out, I am fairly sure I went right over it-but had no problems. I have done it since as well, but try and avoid it (for asthetic reasons as much as anything) The outfall extends 1.5km offshore. All my fishing has been with a Kite Longline Rig. I have Monday off so I am thinking of trying Ocean Beach south of Cape Kidnappers. Will let you know how it goes. Awatoto beach is a gravelly beach and it dips off quickly. Usually only one set of breakers, and in big swells the surf is really big. People have drowned in recent years after being swept off the beach by them. 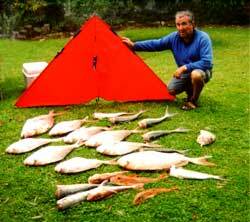 On the kitefishing and kontiki scene Sunday was the only fishable day. The northwesterly change saw four or five kites and one kontiki fisher out trying their luck in the 15 knots of wind. Most had difficulty with the strong rip and high surf left over from the storm during the week. One local fisher who uses a Flexiwing Rig dropped by the shop on Sunday to report his catch. He had managed to take eight big gurnard in the challenging conditions. He was running 12 hooks per set and used salted trevally bait brought from our shop. This was a great result considering the poor conditions on the beach. The commercial fishing vessels who were targeting our bluenose fishing ground were driven away by the big easterlies associated with the low at the weekend. All we have had since is rain which has flooded our local river, so it's looking good for the whitebait season. The big story from this part of the coast over the weekend was the catching of a 14 foot white pointer shark in a net off Cape Turnagain. According to the story the fisherman was unable to pull it in onto his vessel so called up a local cray fisherman who came to assist. Being unable to land the whole fish they had to cut the head off and bring it in two pieces. If you are in the area and want to find out more about kitefishing then call in and see our range of Pauls Kites on display. Left New Plymoth 10am Saturday morning as a strong southeast wind was forecast (about 15-20knots and gusty when we left). Once we got over Mt Messenger there was no wind. Reached Mokau, very light winds from the south southwest. Stayed on as we had booked a cabin at the motor camp, and tried to catch the evening offshore breeze. Breeze arrived about 7.30pm but by the time we got the kite gear on the beach the breeze had died. Up at 6.30am Sunday with a southeast wind of about 5 knots on the beach but much stronger about 300 metres out when we saw the float rise about 30 metres in the air. Reweighted the Dropper Rig and left it out for 20 minutes at around 400 metres out. Caught one 1kg snapper on back trace, and that was all for the next two sets when the wind dissapeared about 10.30am. I was using mackerel for bait and put out a total of three sets of 10 hooks each. Kariotahi to the Manukau Heads. Strongs winds are a must here as there are high cliffs close to beach all along the coastline. These cliffs can make kitefishing very frustrating if not using the correct kite. A local problem in the area is near the Waikato River as lots of river weed gets washed down the beach and can tangle up in the kite line and sometimes bust you off following heavy rain. Another local problem to watch for is the strong northerly sweeps and the longshore rip this creates along beach. If you are using a longline often the mainline gets pulled up the beach by this rip so a Dropper Rig is definitely the best option here. Sharks and stingrays can also be a nuisance at times tangling lines and destroying tackle, (another good reason to use Dropper Rigs in this area). Kitefishing is usually best during periods of strong easterly winds associated with low pressure systems to the north of N.Z. The fish tend to be fairly wide out. Often best time to kitefish is on the outgoing tide just on dusk and often a feed can be aquired. Best baits to use are salted bointo or squid. 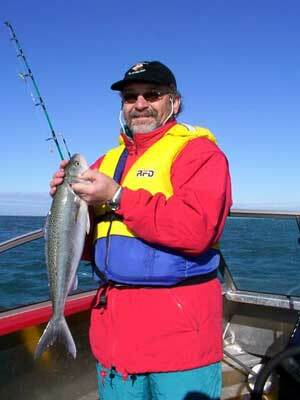 Another good time to fish is when the whitebait are running. The variety of fish that can be caught from Kariotahi include snapper (which at times can be very big), trevally, shark, stingray, gurnard and kahawai. Usually if you have one set and catch one type of fish thats all you will get for the rest of the day. So if sharks turn up go home and have a cuppa, but if you get onto snapper stay out kitefishing and a big fish might turn up. For this area be prepared for the wind to unexpectedly change direction. The best way to catch fish here is to be out there and at least trying every time you can. For myself it took over 20 times of unsuccessfull attempts getting snags and tangles until we got a good set in perfect conditions. The result was a 8lb snapper and two kahawai, this certainly made all the long drives out there worth while. We have had many eventfull trips since getting to know the area well. On one trip we caught a 40 kg bronze whaler shark, boy that was hard to pull in. My personal tip for this area is to fish where there are lots of shells washed up on the shore as fish often feed in these areas at high tide. Hi there, we were visiting Tauranga from Hawkes Bay this weekend. I fished the eastern end of Papamoa Beach from 6.30 - 8.30am on Saturday using a Pocket Sled casting kite and a surfcasting rod. Unfortunately the winds were too light for the kite to be effective, only being able to set 3 hooks at 100m. SEND IN THOSE FISHING REPORTS ! We hope you enjoy your weekly kitefishing newsletter. The only way we can maintain the quality and accuracy of the information is to receive your reports. Please take a couple of minutes and fill out a Fishing Report form of your last fishing trip or better still as many previous trips as you can remember. Click on the link below to see just how easy it is to file a Fishing Report.